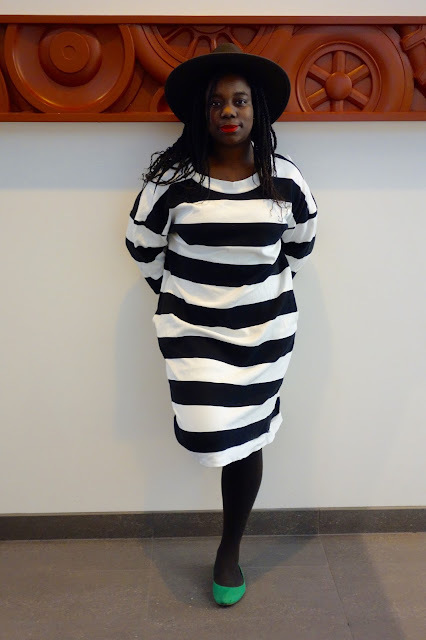 It's been a few weeks since I shared from my Mac Weekly style file, so here's another excerpt featuring one of favourite pieces in my wardrobe, this striped sweater dress from Monki. "Toa-Kwapong’s culturally diverse background is both synergistic and at odds within the context of her style. She has created a unique dynamic for her self-expression. Throw in the hip-hop aesthetic and Minnesota winters, and you have the ultimate melting pot of stylistic inspiration. While the photographs help to convey Toa-Kwapong’s confidence and her variety of stylistic influences, I will attempt to do justice to Toa-Kwapong’s brilliant musings and advice about personal style in the following paragraphs. When asked about the origins of her interest in fashion, Toa-Kwapong immediately points to her Ghanaian grandmother. “I have a grandma who’s really into clothes. She had a wardrobe full of high-heeled shoes and a lot of makeup.” Additionally, Toa-Kwapong credits her grandmother with teaching her that “you could be a woman who’s smart and eloquent and cares about a lot of different things, and that doesn’t have to be mutually exclusive of expressing yourself through style.” Her grandmother’s love of “bright patterns and mixed colors and textures” also fit into what Toa-Kwapong calls a “West-African aesthetic,” referring to the colors, textures and tight-fitting tendency of the clothing popular in West Africa. However, Toa-Kwapong relates more to her mother’s mantra that “comfort should be first. You can look good and feel good, and they don’t have to be at the expense of each other.” Therefore, growing up in Scandinavia was beneficial to Toa-Kwapong because of the “abundance of shape and textures” in the fashion in Norway." Image c/o Shannon Mahedy for the Mac Weekly.